According to a Pew Research Center survey, rule by strong leader is an unpopular concept in most countries. That is especially true in Europe and particularly in Germany where autocratic rule has had devastating consequences in the past. Currently, 93 percent of people in Germany are against a system where a strong leader can make decisions without interference from parliament or the courts. 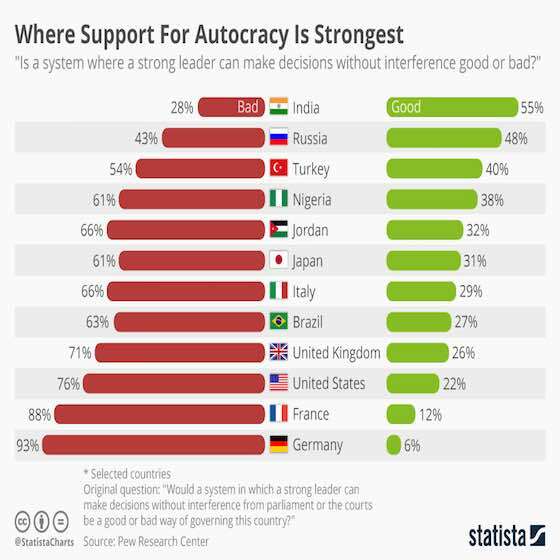 Elsewhere in Europe, there are some places where support does rise; in the UK and Italy, over a quarter of people think autocracy is a good type of governance. In Russia, support for a strong leader rises to 48 percent, not too surprising considering people there still prefer Stalin to Gorbachev. In Asia, rule by strong leader is considered a good thing by 55 percent of respondents in India, along with 52 percent in Indonesia. 42 percent of Vietnamese people would also give autocratic rule the green light while in Japan, a surprisingly high 32 percent share of respondents also say it's a good thing. In the United States, some people are keen on rule by strong leader with the research finding that 22 percent consider it a good thing. World News: "Where Support For Autocracy is Strongest "